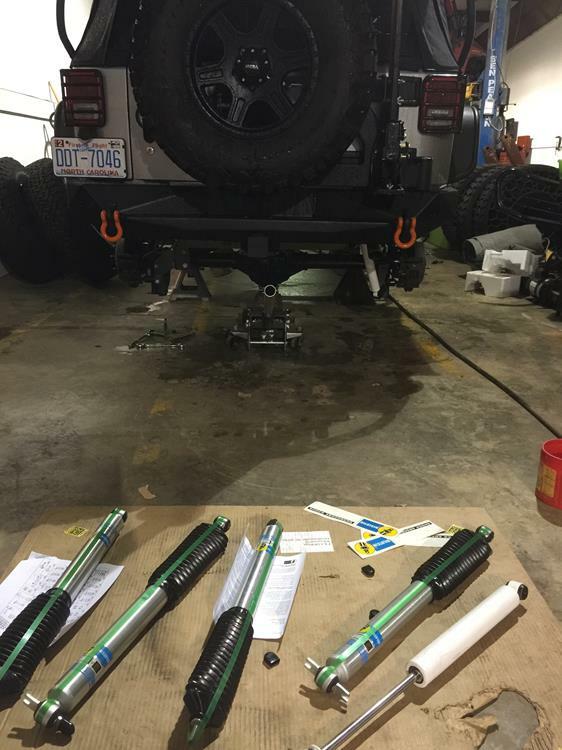 The very first step in the Rightline Gear Jeep Build was to add the MaxTrac Coil Lift Kit to the Jeep. We initially used the MaxTrac shocks as part of the kit. After I installed the FORTEC Steering Stabilizer with Bilstein shocks, I was given the opportunity to try the Bilstein shocks for the suspension as well. MaxTrac offers their Lift Kit with MaxTrac shocks, Bilstein shocks, or the kit without any shocks at all. 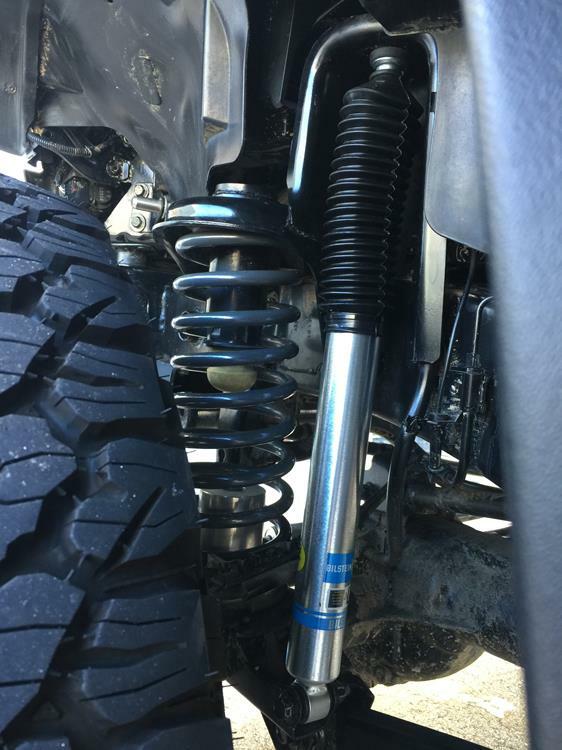 The model 5100 Bilstein shocks for the 2013 Jeep with the 3″ Lift were part numbers 24-146708 for the front and 24-146715 for the rear. The 5100 series offers gas pressure construction, deflection disc valving, and independent compression and rebound tuning. They are made application specific so you need to chose the correct part number for your specific vehicle. I installed the shocks at the same time I was painting the calipers, so all the wheels came off the Jeep at once. I put the jack stands just in front of the rear stabilizer arms so that the MaxTrac rear shocks would extend to their full length before taking them off the vehicle. 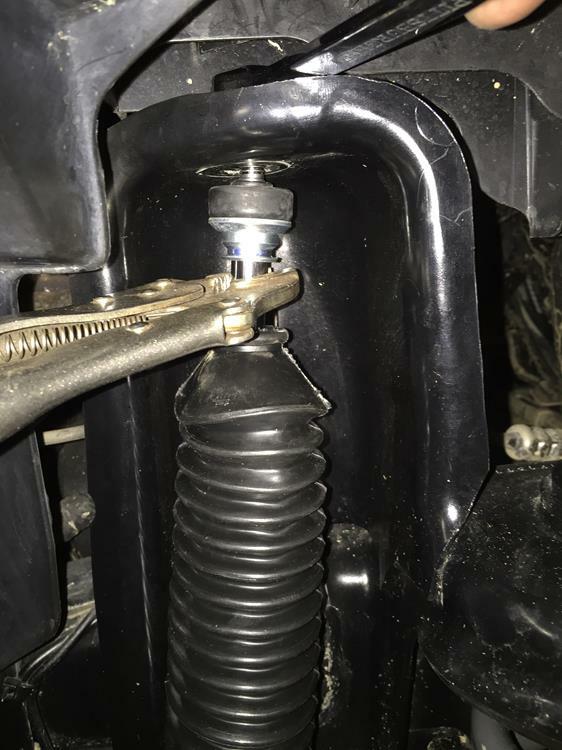 The MaxTrac shocks installed with the pistons towards the ground where the Bilstein shocks installed with the pistons towards the Jeep. The Bilstein shocks have a black “accordion cover” over their shafts to keep them clean and protected. The lower mounts for the rear shocks were a tiny bit too narrow for the Bilstein shocks to slide in properly. I used a giant pipe wrench to open the mounts enough to gain the needed room. The mounts narrowed in again once the mounting bolts were tightened around the Bilstein shocks. The front shocks were a little more challenging to change out. The Bilstein rubber mounts for the top of the shafts were too thick and didn’t leave enough room for the washers and nuts to screw on top of the shafts. I decided to stay with the factory rubber mounts which left room to spare. The issue with the lower mounts being narrow repeated itself, but by now, I was a pro with the pipe wrench. The space above the passenger side shock requires a contortionist to get a wrench in there. Deja vu back to the installation of the MaxTrac front shocks. I think this nut wins the Hardest To Reach Nut Award for the entire Jeep. Once everything was tightened down, I had to re-position the accordion cover over a flange at the top of the shaft. Out on the road, I could feel a difference in driving immediately. The Bilstein shocks are more sensitive and react more precisely. The suspension works more actively from side to side over smaller obstacles, while still reacting strongly to bigger hits. I was extremely pleased with the MaxTrac shocks, but as advertised, the Bilstein shocks are definitely an upgrade. I hope to be able to share more as I put some more time in with the Jeep. It is fantastic that the MaxTrac Lift Kit allows you to have flexibility in your choice of suspension. 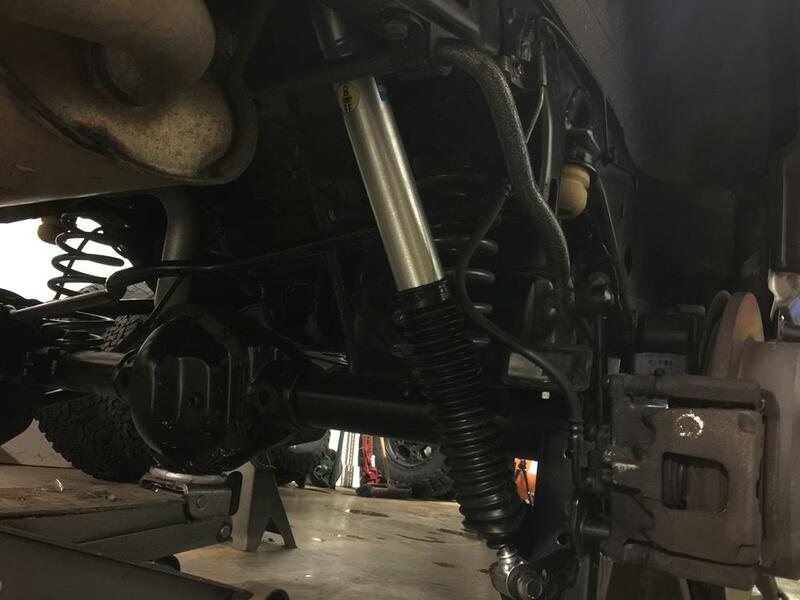 The Bilstein shocks working in tandem with the FORTEC/Bilstein Steering Stabilizer (my favorite part of the Jeep Build thus far) have really raised the Jeep’s performance to the next level. I can’t wait for our time off road in Vegas.